My fifth ground of 2017 was on Saturday 11th March at Westhumble Playing Fields in Dorking, Surrey. 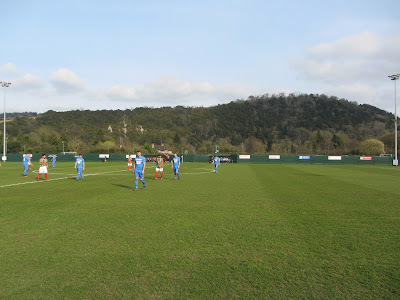 The match was Dorking vs. Staines Lammas in Combined Counties League Division One. 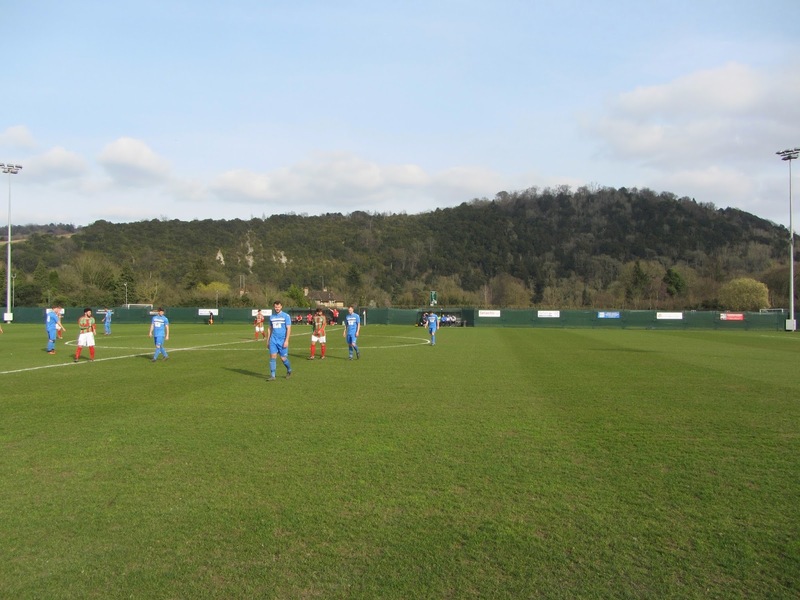 The Westhumble Playing Fields sit at the bottom of Box Hill giving the site a dramatic backdrop. The football ground is part of a sports area situated between the A24 road and the railway line which links the area to London. This railway line borders the ground to the west with a cricket pitch to the north, a football pitch to the east and trees to the south. The nearest railway station is Box Hill & Westhumble half a mile north. 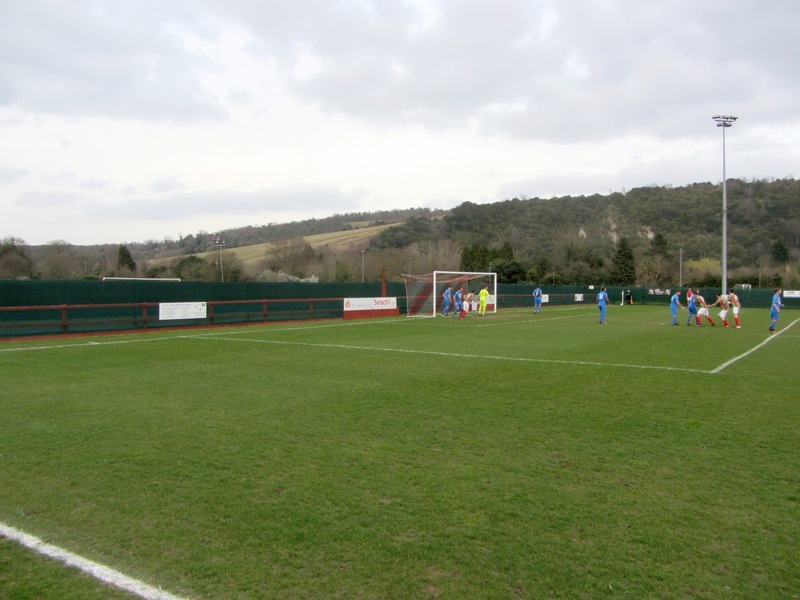 The venue has been the home of Dorking Wanderers since 2007 with Dorking currently groundsharing until both sides move to Meadowbank Stadium for the 2017/18 season. The west side of the ground has two all-seater stands. The larger of the two is a metal and concrete stand level with the half-way line which has 104 seats. The smaller stand is made of wood and metal and has 50 seats including 20 seats designated for officials. Next to this stand is another wooden structure containing a food outlet, boardroom and a small clubhouse. The northern and southern end of this side of the ground are uncovered standing behind a wooden fence which extends around three sides of the venue. By comparison the eastern side is very sparse - there are no spectator areas with a green fence blocking off the area to signify the divide between this and the football pitch behind which is home to Dorkonians FC. 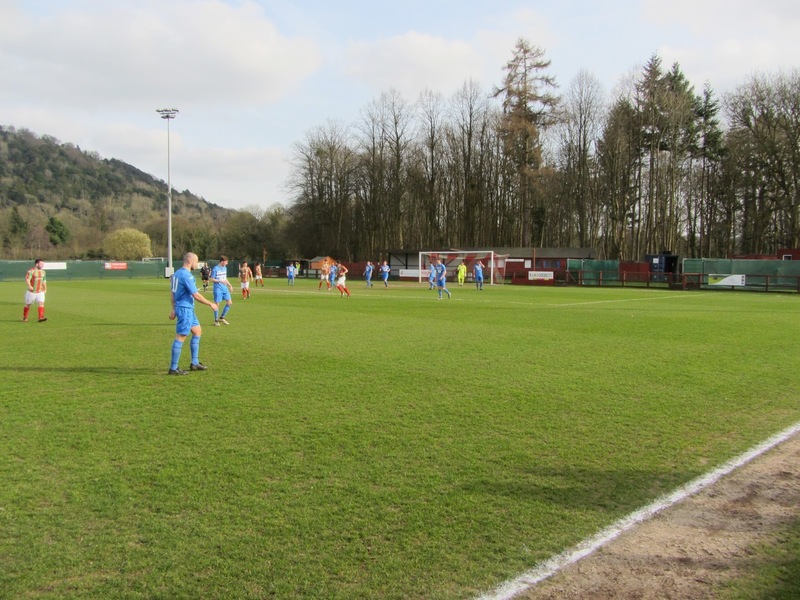 The only structures are the dugouts either side of the half-way line. The northern end is entirely uncovered standing as is most of the southern end though there is a small metal terrace of 4 rows which sits just to the right of the goal. Behind this stand there is a grass area which leads back towards two dressing room buildings (one for home players and medical staff and one for away players and officials). The first half-hour was a quiet affair with nothing of note occurring. However on the half-hour mark Staines broke into the box and the ball was laid off to John Nunn who shot in off the post from 12 yards. In the 41st minute the visitors went 2-0 up when the ball was played from midfield over to Tim Hayden on the right hand side. Hayden had no Dorking players anywhere near him allowing him to take his time before slipping the ball past home goalkeeper Charlie McTigue. This was a little hard on Dorking as it they had been competitive up to this point but Staines took their two clear-cut chances to lead at the break. In the second half the away side looked pretty comfortable. 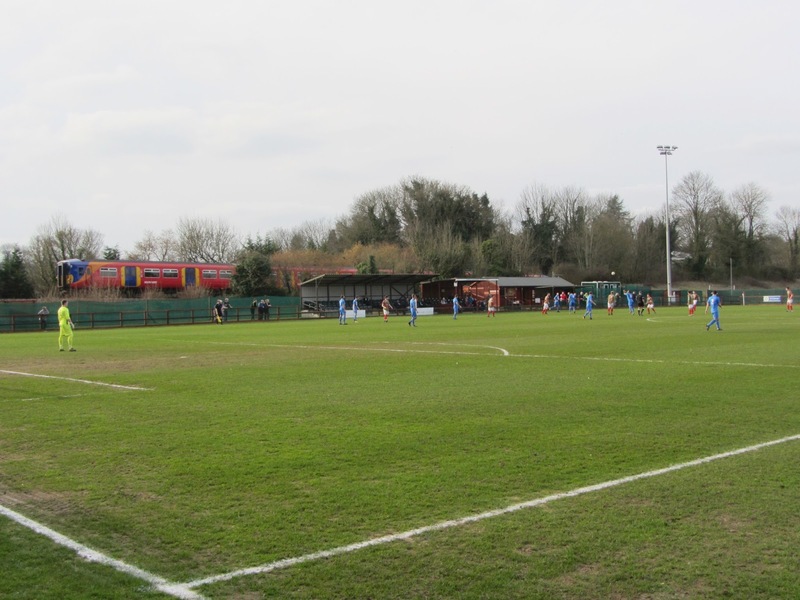 Dorking came close to scoring in the 82nd minute when a ball into the box was clipped over the goalkeeper but a Staines defender was able to clear off the line. In the 87th minute the visitors struck again when substitute Aaron Fraser dispossessed a Dorking player in his own half, advanced towards goal and lofted the ball over McTigue to round off a 3-0 win.